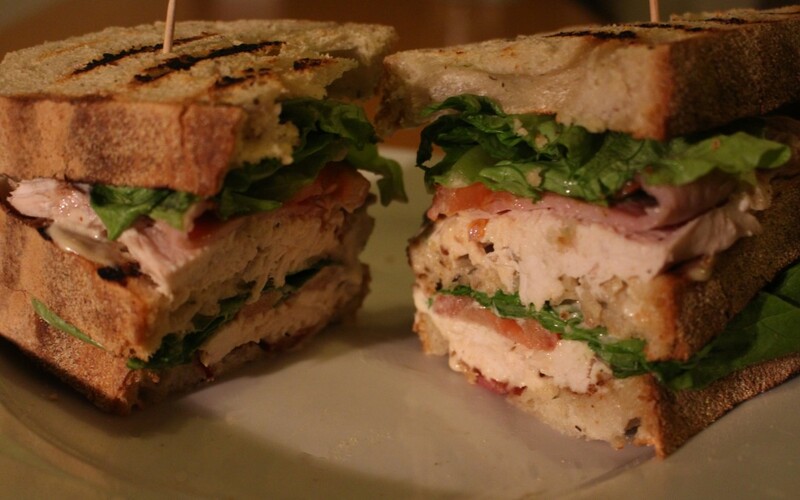 I love a club sandwich but it shouldn’t be just for hotels or fancy take away pack lunches. Sure you can used already cooked and sliced chicken but your missing a trick with have the chicken still warm and juices flowing. The method below is how I usually roast a chicken, the lemon, herbs and garlic really add flavour, plus you can use them in the sandwich assembly later on. Fill the inside of the chicken with some of the cloves of garlic, rosemary and thyme. Pierce the lemon all over with a sharp knife (over the chicken so you don’t waste any of the juice), then insert it inside the Chicken. Sprinkle the top of the chicken with the rest of the herbs, and a little olive oil. Chop the rest of the garlic cloves in half and place on the chicken in the crevases in between the legs and wings. Do the same with the knobs of butter and smear a little bit on the breast. Finally season with salt and pepper. Roast in the oven at 180C (350F). Depending on size between 80-120 minutes or until cooked through. Make sure you regularly baste the chicken every 20 minutes, so it doesn’t dry out. Take out the lemon and garlic gloves from inside the chicken. Use a squeeze of the lemon and a bit of the zest in your mayonnaise along with a couple of teaspoons of the cooking juices. The cloves of garlic should be very soft and you can spread them on the toasted bread for extra flavour. Assemble the sandwich by adding the dressing, lettuce, tomato chicken and bacon to each layer, use cocktail sticks to keep it all together while cutting it in half.